"It's one thing to go way out of fashion, I mean, like, and it's one thing to be, you know, just a little bit out of fashion, and I think that that's where I'm at, and if I'm out of fashion, that's cool, that's okay with me." You know you've stared at somebody's haircut, buzzed in the front and long in the back, and thought: What could they possibly have been thinking? Who in their right mind would want a mullet? Well, the makers of this film were asking the same question, and instead of sneering at or merely passing by the proud mulleteers, they went out to speak with those sporting this unfortunate haircut. The results are on hand here, and if it's not an earth-shattering bit of sociological reporting, it does make for a fairly amusing hour, with compassion for the subjects being interviewed and their decidedly unpopular and unflattering haircuts. The mullet is the one common denominator between such disparate groups as motorcycle guys, country-western singers, lesbians, some soccer players and many inhabitants of the Yucatan, and the film crew sets out to speak with as many of them as possible. There's speculation that George Washington and Jesus Christ may have sported mullets, and there is much debate about the propriety of the mullet in the workplace. I will readily admit that a doctor choosing to go with a mullet would not inspire confidence in me. If he does that to his hair, what's he going to do to my organs? There seems to be a solidarity among mullet wearers—for instance, one biker guy proudly reports: "I had one guy tell me it's a lesbian hairstyle. And that's cool with me. I like women." Also interviewed are a number of hairstylists, some of whom refuse on principle to cut a mullet, others of whom think that, regardless of their own opinions, the customer is always right. Pre-school mullets. Native American mullets. Mexican mullets, casino mullets, med school mullets. Mullets mullets mullets. Interviewed undercover is the webmaster at mulletsgalore.com, who prides himself on his anonymity and his online sniping at mullet wearers—he seems to think that this is going to lead to a better writing gig, but so far, it looks like The New Yorker hasn't come calling. There's also some debate about terminology—some prefer "sho-lo" (for short/long), or, even more charmingly, the "shlong." The phenomenon isn't cracked wide open, but you do have to have a certain amount of respect for someone who so proudly wears a hairstyle that is so profoundly out of fashion. The British on-camera interviewer shares wonder at these haircuts; he doesn't sport a mullet himself, and you're unlikely to rush out and get your own mullet, but have a little respect the next time you see someone with that Canadian hockey player look. Image Transfer Review: The film doesn't seem to have been shot on especially high quality stock, and so there isn't much here visually. The transfer is equally workmanlike�not disastrous, but not especially visually pleasing, either. Audio Transfer Review: The interview footage is generally easy to understand, though the occasional bits of musical scoring are insanely loud, and the balance is a problem throughout. Extras Review: The three deleted scenes shed varying amounts of light on the subject matter. One features a guy with a mullet showing off his cardboard motorcycle, and another has LOTS OF VERY LOUD MUSIC as another bunch of motorcyclists speed around the track. Perhaps the most relevant is an extended demonstration by a mullet barber, who is very big on describing his technique (for those of you playing along at home, that's the #76 Oster clipper with the #1 blade), and he uses the rather nauseous description of "filleting the hair." Also on hand are weblinks to the film's official site and one for the distributor, and trailers for three other Palm Pictures releases. 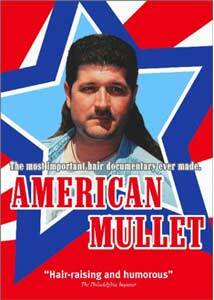 Just why you'd want to sport a mullet may remain a mystery, even after viewing this documentary, but it's an entertaining little tour of a strange bit of American tonsorial culture.